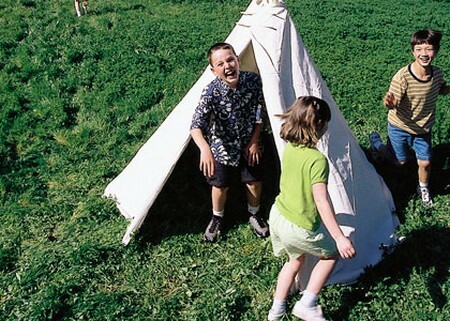 When you hear the word teepee, you most likely think of the popular, sturdy homes attributed to the Native Americans. They were known for their excellence in craftsmanship, and they continue to excel with the same level of prowess they are noted for. A teepee is actually a mobile home. They preceded the versions that we accept as mobile homes today. These well build living structures are very spacious and sturdy. They can stand up to wind, weather and the elements. The most amazing aspect of this time of home is that anyone can make a fire while inside of it. It’s self ventilating. If you ever wanted to know how to build a teepee, here’s how. These instructions will explain to you how to construct a 10 foot teepee. Read on. First, cut the canvase.It should be cut out in a half circle shape. Make the measurements two times the length as it will measure in width. We suggest 15×30 ft. You also need to slice the canvas in the middle. These are smoke flaps for ventilation. Make half circle shaped cuts on the very ends of the teepee material. Place the edges against one another to test. The shapes should form a complete circle. This is a door opening. Next, make a section to put a staff or stick through. This will help to keep the door shut. Sew the extra piece securely to the teepee. Cut out 3 cornered sections of canvas. Sew the sections to the top of the ventilation pieces. Reinforce the places on the smoke flaps that will endure the most work. You don’t want them to tear off. You need to make sure that are sturdy and secure. Secure a piece of rope around the base of the teepee. The ropes have to be even spaced around the bottom perimeter so the teepee can be secured down into the ground. Now, put the rope on top. They should cover all tthe poles after your teepee is placed standing upright. You’ll need a dozen poles that measure at least three feet longer than the width of the whole teepee. If you have a cover that measure 15 feet in width, the poles you should use must then measure 18 feet in length. The poles need to be as straight as possible. Take three on the long poles and form a tripod out of them. Bind them together with some rope. The place where you tie them together should be higher than the cover of the teepee. Place the remaining nine poles around this tripod to fill it out. Place the cover on top of the tripod poles. Drape and secure at the top. Secure the bottom pulling the poles to make the cover taught. Two poles go into the ventilation flaps so make sure they are fully functional. Enjoy your new teepee.